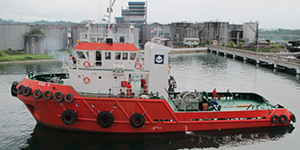 Sapangar Shipyard have successfully Launched a 32M 3200BHP on 30/10/2012, with Redwise Holland supervision of the delivery to South America. Sapangar Shipyard Sdn Bhd (SSSB) was incorporated on 23rd November 2006 with a paid-up capital of RM5,000,000.00 and an authorized capital of RM10,000,000.00. Since its inception, the strived to be a leading and successful ship-building and repair yard in the region. To make this dream a reality, the company has acquired an ideal waterfront that boast itself to be the deepest in this region. With the backing of skilled labour and dynamic staff, the management is determined to steer the yard to be a modern shipyard that produces high quality vessels and at the same time meet our clients’ budget and delivery schedule. Situated on a 30 acres fabrication yard, Sapangar Shipyard is constantly adopting new technologies and improving its facilities in order to meet the high demand of the maritime industry business calls for. Apart from the physical development, Sapangar Shipyard is constantly improving her management system and expected to receive her ISO 9001:2008 certification in 2012.